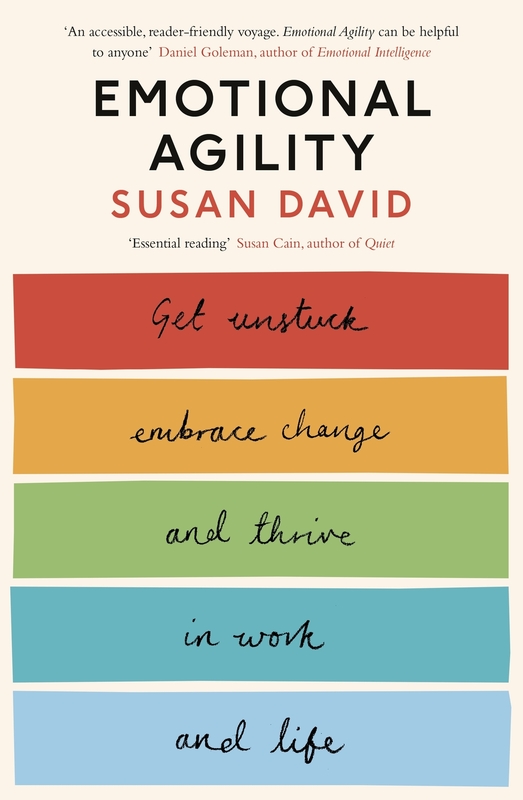 About Emotional Agility — Susan David, Ph.D. The way we navigate our inner world – our everyday thoughts, emotions, and self-stories – is the single most important determinant of our life success. It drives our actions, careers, relationships, happiness, health; everything. For example: Do we let our self-doubts, failings, shame, fear, or anger hold us back? Can we be determined, persevering toward key life goals, but just as importantly, have the insight and courage to recognize when these goals are not serving us, and adapt? In EMOTIONAL AGILITY: Get Unstuck, Embrace Change, and Thrive in Work and Life (Avery, On sale September 2016, Hardcover & Ebook), Susan David, Ph.D. a renowned psychologist and expert on emotions, happiness, and achievement, draws on her more than twenty years of research to show that emotionally agile people are not immune to stresses and setbacks. The key difference is they know how to gain critical insight about situations and interactions from their feelings, and use this knowledge to adapt, align their values and actions, and make changes to bring the best of themselves forward. Emotional agility is a process that enables us to navigate life’s twists and turns with self-acceptance, clear-sightedness, and an open mind. The process isn’t about ignoring difficult emotions and thoughts. It’s about holding those emotions and thoughts loosely, facing them courageously and compassionately, and then moving past them to ignite change in your life. Showing Up: Instead of ignoring difficult thoughts and emotions or overemphasizing ‘positive thinking’, facing into your thoughts, emotions and behaviors willingly, with curiosity and kindness. Stepping Out: Detaching from, and observing your thoughts and emotions to see them for what they are—just thoughts, just emotions. Essentially, learning to see yourself as the chessboard, filled with possibilities, rather than as any one piece on the board, confined to certain preordained moves. Walking Your Why: Your core values provide the compass that keeps you moving in the right direction. Rather than being abstract ideas, these values are the true path to willpower, resilience and effectiveness. Moving On: Small deliberate tweaks to your mindset, motivation, and habits – in ways that are infused with your values, can make a powerful difference in your life. The idea is to find the balance between challenge and competence, so that you’re neither complacent nor overwhelmed. You’re excited, enthusiastic, invigorated. Drawing on her deep research, decades of expert consulting, and her own experience overcoming adversity after losing her father at a young age, Dr. David shows how anyone can thrive in an uncertain world by becoming more emotionally agile. Written with authority, wit, and empathy, EMOTIONAL AGILITY serves as a roadmap for real behavioral change -- a new way of acting that will help you to reincorporate your most troubling feelings as a source of energy and creativity, and live the life you want. EMOTIONAL AGILITY will help you live your most successful life whoever you are and whatever you face. EMOTIONAL AGILITY is currently available at these fine e-tailers. NEED TO PLACE A BULK ORDER? Please contact info@susandavid.com to place a bulk order (25+ copies). GET A FREE CHAPTER FROM EMOTIONAL AGILITY. Subscribe to my newsletter and I'll immediately send you a free chapter from EMOTIONAL AGILITY. You'll also receive weekly updates with resources to help you thrive in work and life.